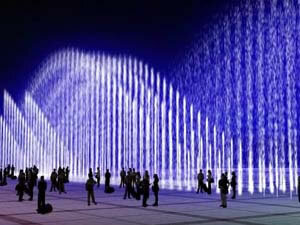 The running fountain is typically built in broad places, such as rivers, lakes, oceans, squares and the like. And it is a combination of straight nozzles. The water jetting time of each nozzle is under the control of timing controller and computer program. Featuring moving ceaselessly, it is capable of exciting and encouraging people's struggle spirit. It can give customers a new, extraordinary and fantastic show; its ceaseless changing water jet ensures customers illusory feeling; and its water pattern is a perfect combination of static and dynamic state. Established in 1984, Guangzhou Water Art Fountain Irrigation Garden Co., Ltd is a professional manufacturer of running fountain in China. In addition to running fountain, we still provide customers worldwide with music fountain, programmed animated fountain, garden fountain, square fountain, scenic fountain, artificial fog fountain (mist fountain), floating fountain, wall fountain, waterfall feature, digital water curtain, creek water feature, direct jet nozzle, central upright fountain jet, morning glory nozzle, flower fountain jet, flat nozzle, fog nozzle, adjustable nozzle, water sphere and hemisphere nozzle, spring nozzle, etc. We have built water features for Spring Festival Evening Gala of China, China Art Festival, and many other Chinese literature and art activities. And so far, we have set up long-term cooperation relationship with customers around the world, such as Malaysia, Brunei, Tajikistan, Saudi Arabia, UAE (United Arab Emirates), and many other countries in Central Asia and Southeast Asia. If you're interested in our running fountain, please contact us freely. Jumping Jet Fountain The jumping jet fountain, just like floating fountain, is typically utilized in creating an amazing view on various occasions, like at trade shows, fairs, exhibitions and amusement parks, as well as in children parks, lawns, resorts and hotels for decoration.